18U Girls CDA Premier 00 (OH-S) claimed a large victory over Princeton SA (PA-W) to open up its 2018 National Championships campaign. 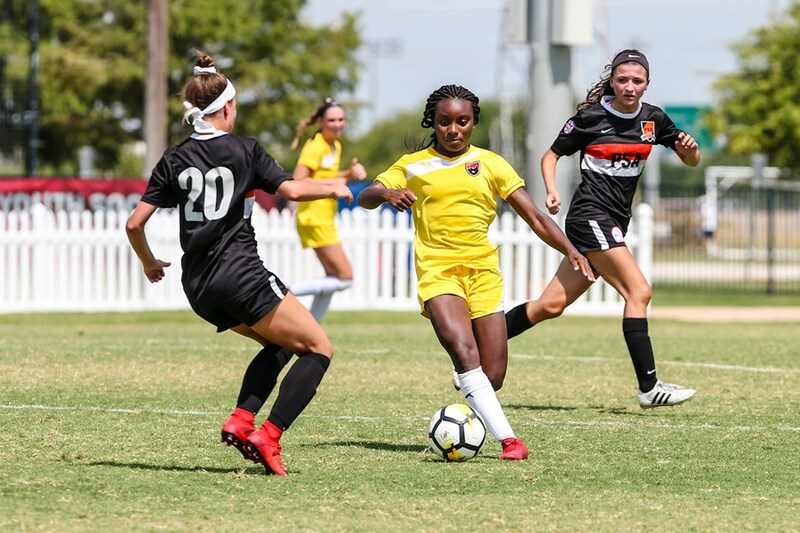 As CDA consists of two Cincinnati clubs merged together, several members have National Championship experience, including players from the 2017 National Champion CUP 00 Gold (OH-S) team. Head coach Tiffany Roberts is also a veteran on the National stage as she has coached at the event for the last four years. “They have tons of experience and have been here before year after year after year, so I think that helps anyone when you have that experience and you know what to expect,” Roberts said. CDA started its scoring spree early as Sophia Denison netted the ball in the eighth minute of the match. After a bit of back-and-forth play, CDA made it a 2-0 game as the ball bounced off the crossbar and Jordyn Rhodes followed it up with a header. CDA continued to hammer away and increased its lead once more before the half when Kaya Vogt found an opening to slot the ball into the bottom left corner. In the second half, Princeton had a couple opportunities to cut into CDA’s lead, including a penalty kick that was saved by the CDA goalkeeper and another instance when Alyssa Oviedo ran onto a chipped through ball, but her shot went wide left. CDA continued to play the ball around and found the back of the net thanks to Lindsey Meyer. Finally, the Ohio South side topped off the match as Rhodes drew the defender in and found Morgan White right in front of the goal for her to pass into the net. It took an entire team effort to earn the win, and Denison feels that the team’s various skills allowed CDA to come out on top. As an experienced team, the CDA players have already met a few of the opponents that they will face this week, but the first day of Nationals could always still come with some difficulty. With the first game ending in CDA’s favor, Roberts acknowledged the importance of the first day of group play and how to proceed going into the next few matches.